Everything you need to pass the exams and get the college credit you deserve. There are many different ways to prepare for the CLEP*. What's best for you depends on how much time you have to study and how comfortable you are with the subject matter. Our test prep for CLEP* College Composition & College Composition Modular and the free online tools that come with it, will allow you to create a personalized CLEP* study plan that can be customized to fit you: your schedule, your learning style, and your current level of knowledge. Our two online diagnostic exams (1 for CLEP* College Composition and 1 for CLEP* College Composition Modular) pinpoint your strengths and show you exactly where you need to focus your study. Armed with this information, you can personalize your prep and review where you need it the most. Our targeted review covers all the material you'll be expected to know for the exams and includes a glossary of must-know terms. The online REA Study Center gives you four full-length practice tests (2 tests for CLEP* College Composition and 2 tests for CLEP* College Composition Modular) with the most powerful scoring analysis and diagnostic tools available today. Instant score reports help you zero in on the topics that give you trouble now and show you how to arrive at the correct answer-so you'll be prepared on test day. 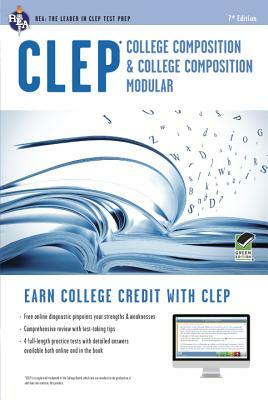 REA is the acknowledged leader in CLEP* preparation, with the most extensive library of CLEP* titles available. Our test preps for CLEP* exams help you earn valuable college credit, save on tuition, and get a head start on your college degree.